Labor day has come and gone. Sandals are pushed to the back of the closet and work boots are coming out. Fall is here and we’re gearing up for harvest. Read below for info on bulk oil for soap, conditions on the ground, and more. In the grove, the end of summer means making sure rows are free from the detritus that accumulates over spring and summer - branches left from pruning, bird nests knocked down by wind, clipped irrigation tubing, clippers fallen from a pocket. 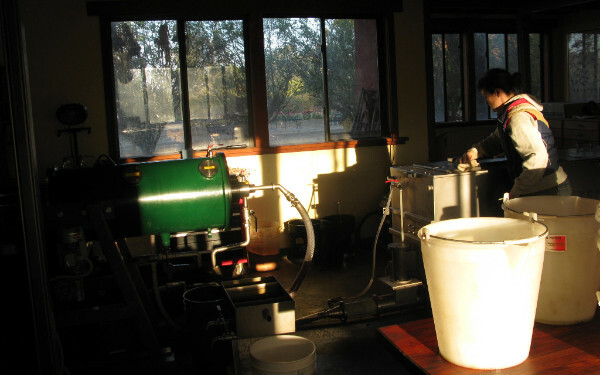 It’s time to clean out tanks, check and prepare the mill, and take stock of the coming harvest. The crop this year is looking to be very small. We’ve heard from just about everyone that yields are lower than ever. Strange weather in the winter (dry) and spring (really wet) may be interacting with what was already an “off-cycle” year. Or maybe the trees are just keeping a low profile, unsure of whether the world deserves the energy, hope, and health they push into their fruit. We have oil for soap and other projects. Last year was a big harvest. We filled our stainless steel tanks and still had oil coming in. We bucketed this oil into food-grade plastic buckets and are now offering it bulk for a deep discount. It’s perfectly fine to eat and still EVOO, but is no longer premium condition. It’s great for soap, skin or hair care, and apparently also for treating swimmer’s ear or cradle cap (just google ‘creative uses for olive oil’). Please contact us at info@flatlandsolive.com if you’re interested. Olio Nuovo is up next. Pungent, fiery Olio Nuovo will be flowing soon. Our first distribution will be in early December, though we may have bottles for sale in mid-november for thanksgiving meals, gifts, etc. It’s a good time to sign up or renew (link) membership, if you haven’t already. Harvest time is gift giving time. 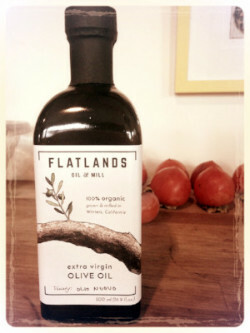 Consider Flatlands for personal or client gifts. We’ll have more information on this soon, but don’t hesitate to contact us if you have something in mind. In addition to the standards (memberships, 100ml and 500ml bottles), we have improved our shipping and will have some special offerings, like gift sets of 100 ml Yuzu 2018 & Nuovo 2019. Here are two from our club members. 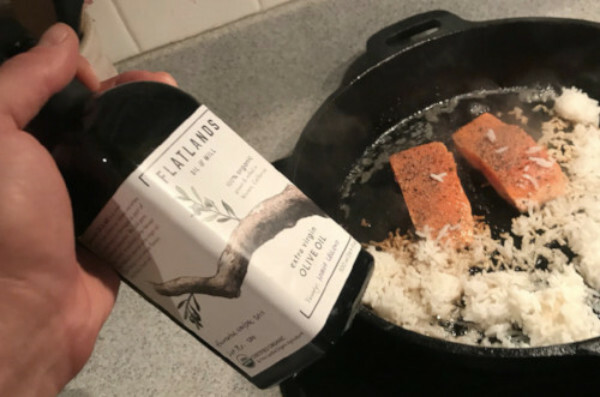 Olive oil cake from Bellingham, WA and salmon-rice fry-up, dressed with EVOO, from San Mateo. Please send us your pics or favorite recipes and uses. We’d love to share them.